For the past 20 years, local high school students have descended upon Upton Hall’s ceramics studio with one goal: to win a series of messy-but-fun timed events that compose the Western New York Clay Olympics. Think building clay towers before they topple, creating as many clay cups as possible, and using a potter’s wheel hands-free. On May 22, approximately 30 students from Kenmore East, Lewiston-Porter, and Pioneer high schools participated in this year’s Clay Olympics—all accompanied by art teachers who are alumni of the college’s ceramics and art education programs. The Pioneer High School team, led by teacher Scott Losi, ’97, ’02, took the Clay Olympics trophy this year. Losi received good-natured jabs on the win from his fellow teachers, who met as undergraduates. “We not only challenged each other creatively while we were students, but we also formed lasting friendships,” said Brett Coppins,’96, ’02, who organized the first Clay Olympics with Robert Wood, professor of art and design and coordinator of the ceramics program. Coppins recruited three of his fellow alums to join him. Until a few years ago, alumna Ann Perry-Smith and her students at Lancaster High School also participated. Wood calculated that since 1999, 24 students from the four high schools have enrolled at Buffalo State and earned degrees in ceramics, while many more enrolled in other art and design disciplines. Some went onto graduate school and found careers in art education, studio art, and many peripheral art-related careers. Present at this year’s Clay Olympics was ceramics program benefactor Sylvia Rosen, ’71. In 1987, Rosen and her late husband, Nathan, established an endowment at the Burchfield Penney Art Center. 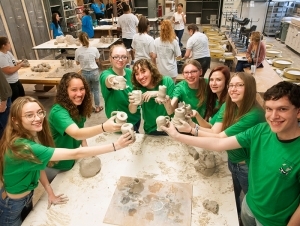 Along with enabling the college and the Burchfield Penney to hold biennial craft art exhibitions and host field specialists, the Rosen endowment supports the Clay Olympics including cash prizes for winners in the accompanying competition in which students bring their own artistic creations for judging.